It was the most uncomfortable and awkward train ride I’ve ever had. Traveling through the middle of China from the far south of Guangzhou to the capital city Beijing in a 22 hour train ride. On top of that I was sitting on a hard seat with noisy Chinese all around me. It wasn’t pleasant to say the least, but looking afterwards at it, it was my greatest travel experience so far. It began when the Chinese wife of my Dutch friend booked me a ride for this ‘journey from hell’. Because of some miscommunication she didn’t book me a ticket for the soft sleeper which I wanted, but for a hard seat instead. I wasn’t aware of it when I tried to board the train and thought it was a misunderstanding when the conductor pointed me towards the coach with the crappy seats. Unfortunately it wasn’t a mistake. 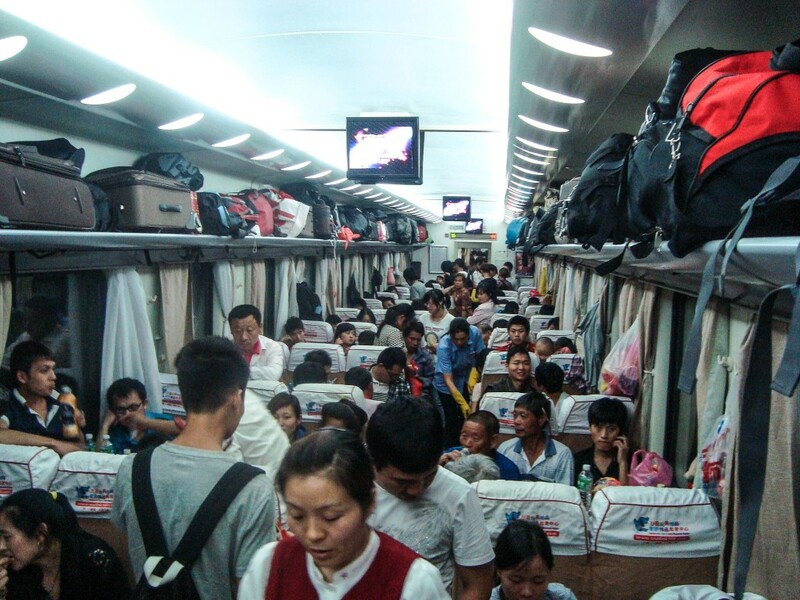 In this part of the train there wasn’t any Westerner to be seen, there were only Chinese. The first hour was, without exaggeration, extremely terrible. People eating noisily, babies screaming, kids playing their games on volume 10 and high pitched Chinese conversations. After a couple of hours I got somewhat used to it and I got to talk with 4 young Chinese students of the Sun Yat Sen University that sat on my left. They were the only ones in my proximity that could talk English. I asked them about their student life and their reason to visit Beijing. It made me a little more comfortable and the others around me saw they could trust me. A little later the Chinese guy next to me tried to talk to me. ‘Hello,’ he said, I replied and asked his name. Unfortunately he didn’t understand what I was saying; ‘hello’ was the only English word he knew. Extra hand gestures did the job and finally he understood. He wanted to know more about me and also wanted learn more English words, so I showed him the dictionary that was in the back of my Lonely Planet. Now he was able to ask me some simple questions, which I, in turn, could reply. It was fun, but pretty fast he turned to talking Chinese again when he wanted to ask me something more difficult. For example my reason for being in China. He was looking around if anyone could translate and luckily the students where kind enough to help. This way we had translators and could ask even more. In addition, I got to learn some sentences in Chinese. In the end, a few hours before arriving in Beijing, he even asked me if I would like to go with him to his friend where he would stay. Although this was a very friendly gesture, I had my own plans in Beijing and I had to deny. After all of it I realized I had been given the rare opportunity to get submerged in the Chinese culture. 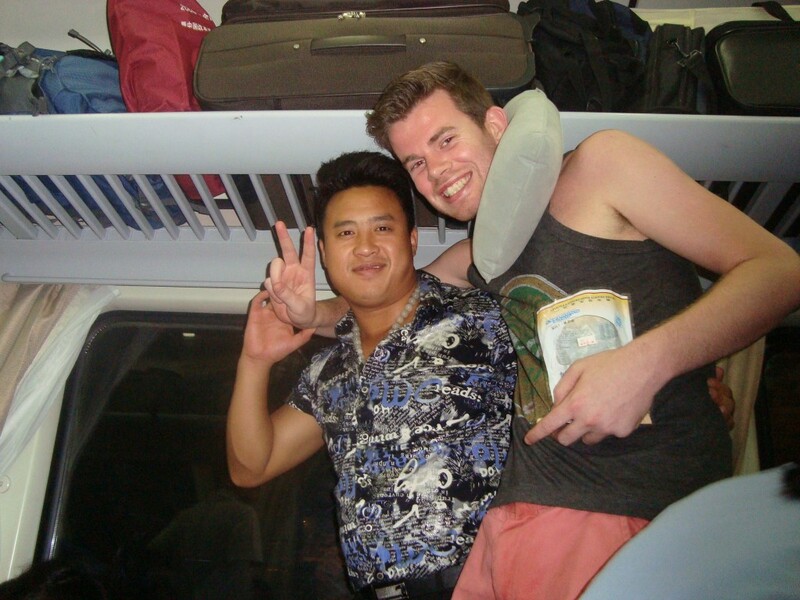 To endure 22 hours in a train full of Chinese citizens is the perfect way to get to know their ways of doing. So if there’s one tip I could give it’s this: do not always take the most comfortable way of traveling. So instead of the ‘soft sleeper’, take the ‘hard seat’ sometimes. It might get you into a unique experience. Previous post: Transcending myself. Climbing Mount Elbert. Next post: Did you know Dali was the Graphic Designer behind the Chupa Chups logo?